Perfectly Created Chaos! : Get Sketchy and "Be Happy"
I spent most of my morning yesterday doing some errands, so I didn't have a chance to start stamping anything until late in the afternoon and before I knew it, it was time to start dinner and unfortunately, I didn't have time to do my post. My card for today is for yesterday's Get Sketchy challenge. I haven't had a chance to participate with this challenge in quite a while, so I was happy to have a chance. This was a very simple sketch, so I tried to keep my card fairly simple as well. I started with a Sahara Sand base and then added a layer of Elegant Eggplant. For the Bashful Blue piece, I stamped it with the Print Pattern background stamp from SU in Bashful Blue ink before cutting it in half and then rounded all the corners. I cut a strip of Gable Green paper and used a stamp from LYB "Zinnia" stamp set with one of the purple inks from a Color Box Queue chalk ink. The main images in the middle are also from that same LYB "Zinnia" stamp set. I matted both and then placed each on to another piece of Sahara Sand. Next, I added the Eggplant bow in between the two center pieces. To finish the card, I added the faux white stitching lines around the two Sahara Sand pieces and then rounded the edges of the card. Simple, but I was pleased with the way it turned out. I hope you like it too. Have a great weekend and I'll see you all on Monday! Beautful card! The faux stitching is great, ads such a nice touch to it all! Nice job!! Love the colors!! Thx for joining us @ get sketchy!! 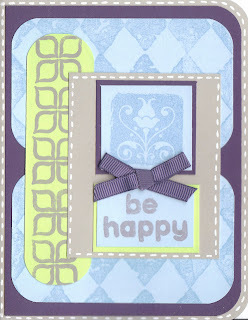 This card is perfect, love the sentiment and the colors!